When it comes to the vital task of promoting environmental awareness, nobody is doing more than Clonmel Waste Disposal Ltd. The national service provider offers a full range of waste management services to both the commercial and domestic sectors. It boasts a 23-strong fleet, including two brand new eight-wheel hook skip trucks. Since its establishment in 1989, Clonmel Waste Disposal Ltd has been providing an efficient waste management, disposal and recycling service to the community and industry of South Tipperary and surrounding counties. Headed by managing director John Molloy, who is joined by his son Kieran and grandson Chris, the family-run business has grown to employ 67 people. It considers efficiency, reliability and quality of service to be at the core of its operation and constantly strives to achieve customer satisfaction. Providing a cost-effective and efficient service for the management and recycling of domestic and commercial waste, Clonmel Waste Disposal is dedicated to the diversion of waste from landfill through the reuse of valuable resources to create closed material life cycles. The company offers a wide range of services and caters for a comprehensive range of waste disposal needs. Clonmel Waste Disposal provides waste collection, recovery and recycling services for industrial, commercial and domestic types of waste. The Co. Tipperary-based concern meets individual customer requirements by providing tailor-made waste management solutions. Its broad range of waste collection and recycling services, modern fleet of equipment, coupled with its extensive range of skip sizes, means the company is in a position to meet its customers’ individual requirements, no matter how big or small. The company’s success is based on the solid foundations and values of a family-run business that ensure customers receive the very best service there is. Clonmel Waste Disposal considers Ireland’s race against waste to be of utmost importance and is committed to recycling as much waste as possible. The family business has invested substantially in its Cashel Road Recycle Centre, which is located on a 15-acre site and currently recycles 24,000 tonnes of waste per year (this figure is expected to double in the next few years). The Recycle Centre is open from 9am to 5pm Monday to Friday and from 9am to 2pm on Saturdays. The recycling facility is designed to allow the general public to bring their general waste and recyclables to a centrally located site. Clonmel Waste Disposal entered the local domestic waste collection market in late 2009 and now caters for thousands of households in the South Tipperary area. Other domestic waste services provided include skip hire, waste collection, waste bags, confidential shredding and hire service. The following services are available to the commercial sector: skip hire, waste collection, waste bags, confidential shredding, hire service, waste transportation, commercial recycling and wheelie bins. In addition, the well-regarded company shreds approximately 300 tonnes of waste wood, wooden pallets, roots and green waste per week. The waste wood can be used for chipboard or fuel, while cut-off branches can be used as compost or chipwood. Between two and three truckloads of the shredded timber is sent to the UK every week for recycling. A modern mobile shredder, along with an operative and a JCB waste handling loader, are available for hire in the Tipperary region. This powerful machine is designed to process approximately 7-10 tonners per hour of waste wood, wooden pallets etc. This service is available for use in many different settings, including building sites, commercial premises and waste disposal and recovery facilities. It is effective and efficient in providing customers with a waste management solution to an extremely bulky waste type. Clonmel Waste Disposal’s large fleet of trucks are a common sight around the roads of Tipperary and surrounding counties. The trucks, with their distinctive green cabs, are always immaculately turned out. They are a mixture of Mercedes, Scania, Dennis and Volvo. Maintenance and repairs are carried our in-house where there is a five-bay garage. 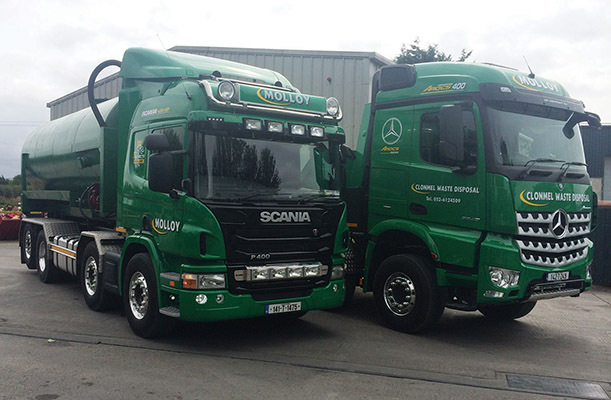 The latest additions to the fleet are two new eight-wheel hook skip lorries. One is a Scania, which was purchased from O’Mahoney Commercials in Thurles, while the other is a Mercedes which was bought from Surehaul (Ireland) Ltd in Clonmel. “These new vehicles have already proven to be a great addition to our fleet,” enthuses Clonmel Waste Disposal transport manager Rob Chandler. Many truck show enthusiasts would be familiar with the Clonmel Waste Disposal fleet from their appearances at the Tipperary Truck Show in Dualla, the Waterford Truck & Motor Show and Truckfest South West and Wales. At last year’s inaugural Tipperary Truck Show which, rather fittingly, is sponsored by Surehaul, the waste management specialists won the ‘Best Rigid’ category. Clonmel Waste Disposal’s commitment to the local community is reflected in its sponsorship of Clonmel Rugby Football Club. The club, which has dominated the Munster junior rugby scene recently, is coached by former Munster and Ireland back-row Denis Leamy. In summary, Clonmel Waste Disposal continues to go from strength to strength by providing a cost-effective and reliable service to its customers. Why not give them a call today?